December PPM’s are due to release starting today. Look for NYC, Atlanta, Dallas and more later this afternoon. With this release we’ll see the first effects of “all Christmas” music on several stations. The December release continues tomorrow and the remaining markets are on Friday. Christian Radio Ratings on HisAir.Net are sponsored by ShareMedia Services. For over 17 years WNWC/Madison (Life 102.5) has been partnering with W.I.N.R.S for Christ to place Shoe Box Gifts into the hands of the most needy. 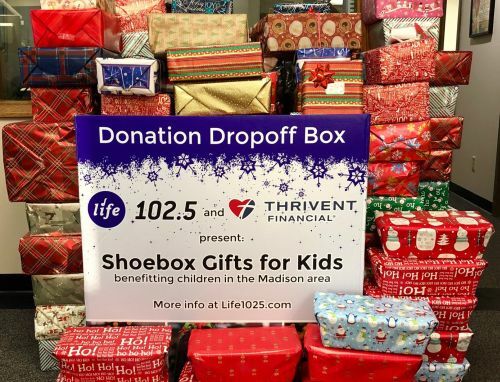 Listeners are encouraged to fill shoe boxes with toys, school supplies, hats, gloves, etc., wrap them up, and bring them to a drop off location around Southern Wisconsin. Gifts are then distributed to children in the community who may not have anything else to open Christmas morning. Last year Life 102.5 brought a record number of boxes: 1,400. This year they broke that record and brought in 1,850. Shoeboxes will be distributed throughout this week. EMF is purchasing WATG/Trion, GA (The Ridge) for 200k from TTA Broadcasting, Inc. WATG is Class A FM station at 95.7. The Malaysian Broadcasting Department has refuted allegations that religious programming aired on Radio Television Malaysia (RTM) would be reduced beginning next year. The statement was in response to the report in the social media that claimed that religious programs on RTM would be reduced by 20 per cent beginning next year. PRAYER REQUEST: KADI/Springfield PD Rod Kittleman recovering from pneumonia in the hospital. Rod went through a partial leg amputation a few months ago.